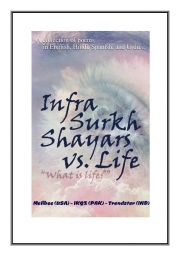 Description of "Infra-Surkh Shayars (eBook)"
A collection of poems in English, Hindi, Spanish and Urdu. © Freelance Talents (2013), all rights reserved. Reviews of "Infra-Surkh Shayars (eBook)"